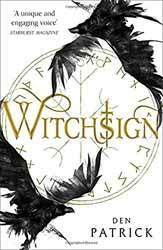 Witchsign (2018. 450 pages) is a new fantasy novel, written by Den Patrick who had previously written the Erebus Sequence. This is the first of three books in the new Ashen Empire trilogy. When your looking for a new story, you’re always hoping for something new and special, I have lost track of how many authors lazily fall back on the old trope of kid born in poverty who has a destiny meets a wise man and finally kills the big bad to gain the throne. Not so Patrick. Steiner lives in a world where magic exists and those who wield it can often kill with the slightest of gestures, but Steiner is completely devoid of any magic power. Steiner is a young man who comes from a piss poor town whose only hope of staving off starvation is to become a blacksmith. He is particularly bad with romantic relationships, so much so that he seems incapable of taking the massive hint from one of the local girls. He rightly distrusts and hates the Vigilants who come to test the children, taking away any that show witchsign, they had, after all taken his own mother away and Steiner fears that his strange sister may have inherited her mothers gift. Steiner loves his sister, a feeling of protection which creates the misunderstanding which sees him being taken in her stead. This is not the action of a nascent hero in waiting, because, in truth, Steiner isn’t that bright. So, we have a very ordinary young man thrown into extraordinary circumstances who must live on his wits to survive, devoid of his own convenient magical deus ex machina to fall back on. Patrick has chosen to set his story in a faux medieval Scandinavia and though there is a nod to that land in many of the name and places he has sensibly chosen to colour the language in a tone which will feel familiar to an English-speaking reader. Its not taking too much away from the story to say that when Steiner reaches the island of Vladibogdan that he is not killed, even when they discover that he has no magical abilities. Otherwise this would be a short story and not a novel. What he does find is one great lie. The empire isn’t killing those with witchsign but utilising them as a power to oppress others. This is not another Harry Potter retread as Steiner is thrown into the lowest depths of the gulag island and set to work in the furnace, to survive on his strength and the strength of his friendships. Although Steiner is the main POV character, the book does go back to his sister who has the real power as we watch he blossom into a powerful witch. I did like the way the book was written as Patrick, apart for the layer of Scandinavian influence, eschews the desire to fill his prose with either a lot of unnecessarily complicated fictional words or a lot of fake medieval speech. It makes the book very readable, keeping the style very clean. Although this is part of a trilogy the book stands up on its own having a satisfying ending and overall it’s well worth picking up.